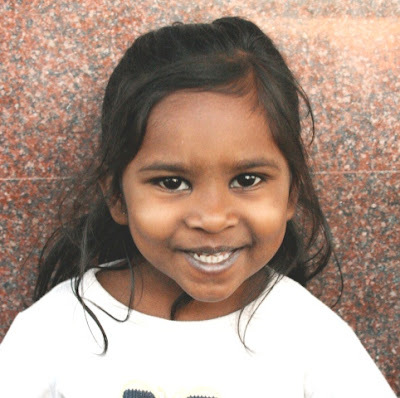 We need 50 more partners for our ministry to orphans in India, under the direction of Pastor George Fernandes. Many children at the New Hope for Children Orphanage are not yet sponsored. Your gift of $29 per month provides all of your child's needs: food, clothing, shelter, education, and most importantly your love and prayers. You can write to and send little gifts directly to your child in India if you wish. Your child will write to you at your home address, with the mail coming from India. This form of sponsorship is very much like a "long-distance" adoption. You can learn more about the New Hope for Children Orphanage and how you can become a sponsor by clicking on this link. This is Monica. She is 6 years old. She loves to color and draw. One of her favorite activities is blowing bubbles. Her brothers Thomas and Joseph also live at NHCH. To begin sponsoring Monica, click here.